S.A.F.E. 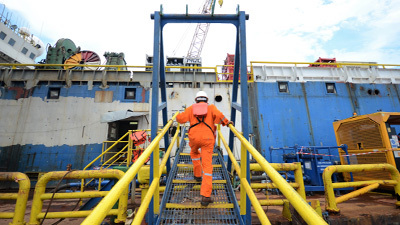 Structure Designs supports marine manufacturing and maintenance facilities around the world because we understand the value in safety and efficiency — and we know how to provide you with both. Our OSHA-compliant work platforms provide upper-level access for both maintenance and manufacturing of boats, ships, and submarines. Work alongside our team to design your own custom multi-purpose stands that interface perfectly with your equipment, from propeller to periscope. With options like adjustable handrails, extendable sliders, and on-board air and electric hookups, our platforms are the safest and most efficient solution for marine equipment technicians. SAFE Structure Designs has number of customized maintenance and safety solutions for our clients. Click on a photo below to view a gallery of projects we've completed for a variety of clients in the marine sector. Looking for more information about our products? Contact us here.